If you’re just tuning in, this series is dedicated to sharing a snippet of the main findings of our report entitled, “The Bicycle Choreography of an Urban Intersection—an anthropological study”. At the end of the series, we will unveil this report for the first time. Our first segment described behavioural findings from the study. The finer details of the urban theater and what we think really makes ordinary movements “come alive”: micro-communication through body language, subtle shifting at stop lines, and any number of other minute details discovered through close observation. Here, we take the quantitative data from the study and tell a story about our cities. A story about how to understand allegedly ‘rule-bending’ behaviour to discover how municipalities can better relate to these users and the desires of all on our roads today. Thanks to some solid work by data wunderkind Pedro Madruga, we were able to visualize the finer details of the 16,631 bicycle users’ movements. 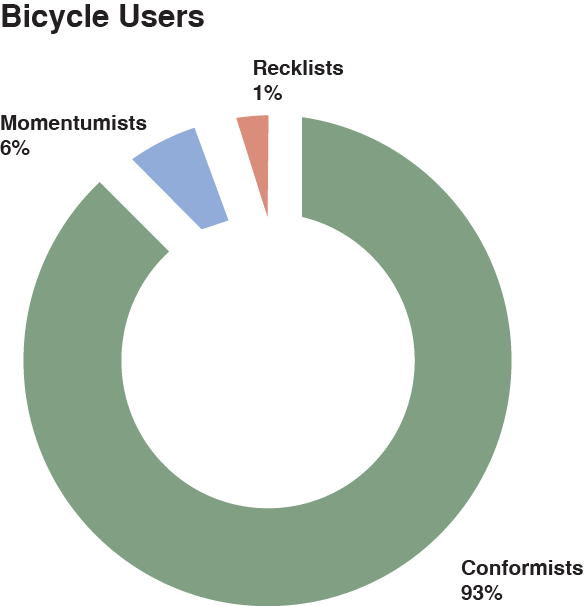 Let’s return to the three “types” of Copenhagen cyclists that we introduced in the previous section: Conformists (93%), Momentumists (6%), Recklists (1%). The major reason why cyclists bend rules is to keep their momentum. As stated in the previous installment, bicycle users who bend the rules use a posture change that lets them communicate with others. Their more upright and alert position says they are aware of their infraction and the disturbance will soon dissipate. 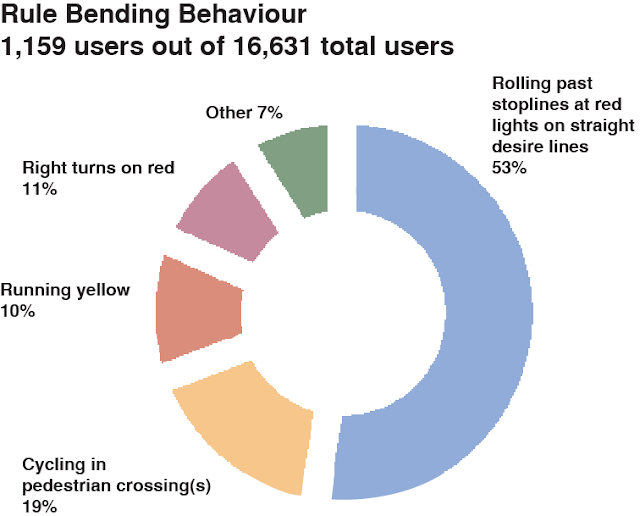 Cycling or scooting through pedestrian crossings made up 19% of the observed occurrences of rule bending and showed examples of these posture changes. The majority (53%) of the minor rule bending occurred as bicycles rolled past stop lines. As they “crawled” over the official stopping area, other bicycles often joined, their behaviour was influenced by the first bicycle’s position at the light. We dissected the presence of momentumist behaviour according to travel direction to investigate whether road design has an effect on prevalence of momentumists. Based on similar ratios in all directions, these differences in road design did not seem to influence the rule bending behaviour. Cyclists still bended rules to save momentum. Contrarily, the left turns from North to East had the lowest rule bending ratio: 1% (2 momentumists out of 329 conformists). When turning right, the most frequently occurring “momentumist” behaviour was turning right on red. Something that is already legal (or changing soon) in many other cities. When turning left, the most common infraction occurred as momentumists saved time by cycling through the crosswalk. Not even the Recklists were truly “reckless” all of the time. 82% were classified with the ‘other momentumists’ data, so the second largest infraction was running a yellow light while it was turning red (10% of infractions). In the next section, we will explain our own “Copenhagenize Fixes” that take these rule bending behaviours into account and work with the 16,631 road users’ movements. One other important detail, often overlooked by traffic planners, is the simple U-turn. 35 were observed throughout the 12 hour observation period. 32 of these 35 occurred in a pedestrian crossing and the remaining 3 took place before the cyclist reached the crosswalk. We believe that deviations such as U-turns, cycling through pedestrian crosswalks, turning right on red lights, and walking outside of walkways are not opportunities for increased policing of cyclists or pedestrians. Instead they are opportunities for city and traffic planners to be more creative with the services they deliver to road users. We couldn’t be more excited about sharing these fixes with you because of the pragmatic solutions they deliver. They may not fit every city. That is where urban thinkers in every city come in. “Old-fashioned” observation, analysis, and follow-up studies show new ways forward in urban planning. Ironically by returning to the “old” ways. tags: behaviour, choreography of an urban intersection, copenhagenize design co.